* Aerialists dance, weave, and flow through the air. Dynamic drops add dramatic effect to make an overall stunning act. * Dynamic tumbles add dramatic effect to make an overall stunning act. 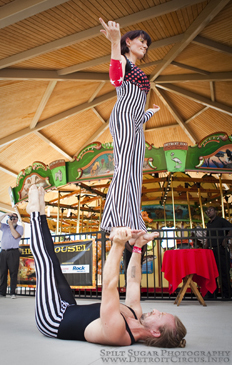 Perched high on the static trapeze, performers execute a jaw-dropping display of powerful moves and flexible poses. Trapeze artists swing, fly, or just hang about - it all depends upon the amount of height and space you have, and the effect you desire to create. Trapeze artists can fly, swing or just hangabout - it just depends upon the amount of height and space you have and the effect you desire to create. Weaving their bodies around the hoop, aerial hoop performers display lyrical flexibility and strength as they contort and spin. 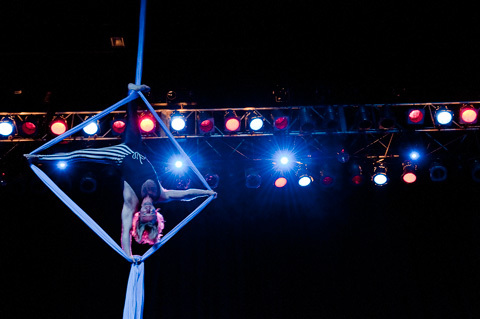 A smart choice of aerial entertainment in venues with lower ceilings, as rigging a hoop requires far less height for no less dramatic effect. 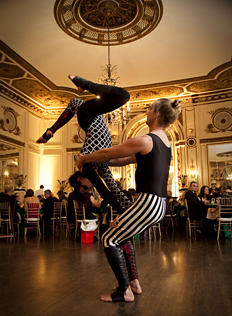 Tying themselves into ornate poses, performers captivate the audience with grace, poise, and incredible strength. 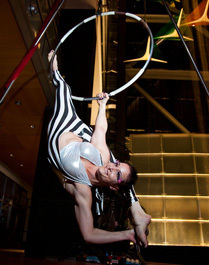 An aerial silks performance is a dramatic, high-impact addition to any event. 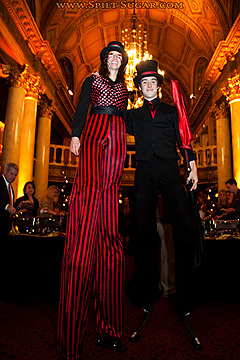 Stilt walkers are an eye-catching and entertaining addition to any event. 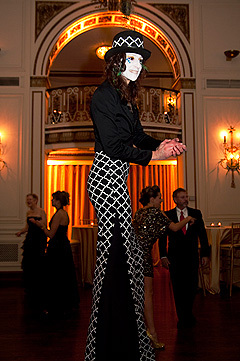 Highly visible and always striking, our stilt walkers are available in themed costumes, as characters, as soloists, duos or groups, and even performing additional skills such as fire and acrobatic stilt acts. 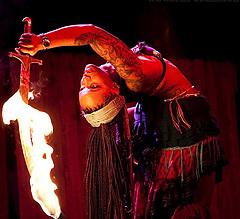 Fire performance creates a bold impact for the beginning or end of an event. 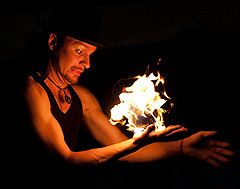 We provide solo fire acts for smaller events, or a large number of fire artists creating a stunning visual spectacle for a major event. 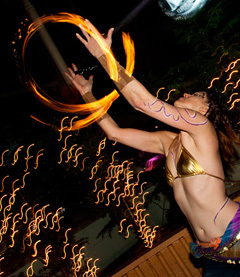 We have fire breathers, fire eaters, fire hoopers, and more! 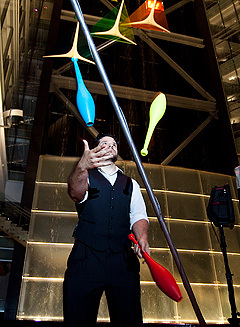 Walkabout entertainers add an extra, funky dimension to your event. 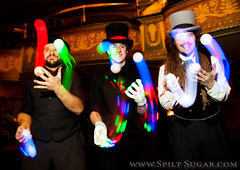 Our performers mix and mingle with your guests, interacting and entertaining as they go. 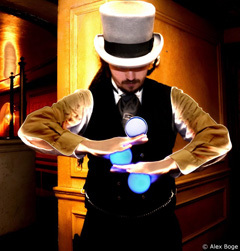 We provide belly dancers, jugglers, illusionists, and more. Adagio Acrobatics incorporates aspects of body-balancing, yoga, and traditional partner acrobatics to create a beautiful and spellbinding performance. We perform myriad acts of strength, balance, and flexibility requiring two people. This act pushes the limits of physics and human ability all while being performed with cool grace. Acrobats balance on the hands or a special contortion box or rig. 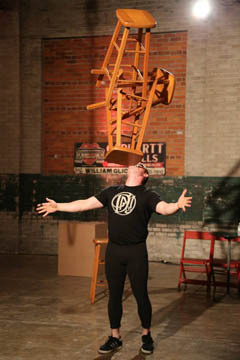 Hand balancing acts are performed on or off stage, on the ground, or on your choice of apparatus. Contortionists combine extreme flexibility and grace as they bend into eye-popping poses that will redefine what you thought were the limits of the human body. - Shows: set piece shows are often performed to music. - Walkabout: strolling performance with short set pieces. - Ambient: static performance which is not a set show.